Covering the fundamentals of computer graphics and computer graphics programming. It explains the principles, as well as the mathematics, underlying computer graphics - knowledge that is essential for successful work both now and in the future. This book is designed to include the basic information needed in an introductory course. It also includes example tutorials for the use of graphics editing programs Microsoft Paint, GIMP and Blender, etc. This book offers beginner-level instruction on what many consider to be an advanced concept. It teaches programmable rendering for beginning graphics programmers, from the ground up. This book covers the most advanced technologies in computer graphics: modeling and rendering technologies. It also includes some visualization techniques and applications for motion blur, virtual agents and historical textiles. This book is intended to give the necessary mathematical background on wavelets, and explore the main applications, both current and potential, to computer graphics. The emphasis is put on the connection between wavelets and the tools and concepts. This book provides a broad, up-to-date survey of the field of graph drawing. It covers topological and geometric foundations, algorithms, software systems, and visualization applications in business, education, science, and engineering. This book is a straightforward, step-by-step guide to rendering graphics with Direct2D. You will build a complete charting system that features multiple pages, zooming functionality, and printing support. This book will take you through the process of texturing, lighting, rendering, compositing, and post-processing to make a photo-realistic 3D render. This book is a series of tutorials to help new users learn Blender. The tutorials increase in difficulty, and later tutorials are built on the previous ones. Therefore, Blender beginners should follow the tutorials in sequence. This book is a definitive resource for getting started with 3D art in Blender, one of the most popular 3D/Animation tools on the market. This book will show you how to apply OpenGL graphics programming techniques to any device running the iPhone OS - including the iPad and iPod Touch. 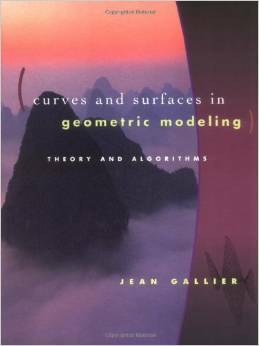 This book offers both a theoretically unifying understanding of polynomial curves and surfaces and an effective approach to implementation. It is also an exellent introduction to geometry concepts used in computer graphics, vision, robotics, geometric modeling. A comprehensive, tutorial-style introduction to the algorithms for reconstructing cross-sectional images from projection data and contains a complete overview of the engineering and signal processing algorithms necessary for tomographic imaging. This third volume of the best-selling GPU Gems series provides a snapshot of today's latest Graphics Processing Unit (GPU) programming techniques. This sequel to the best-selling, first volume of GPU Gems details the latest programming techniques for today's graphics processing units (GPUs). It focuses on the programmable graphics pipeline available in today's graphics processing units (GPUs) and highlights quick and dirty tricks used by leading developers, as well as fundamental, performance-conscious techniques. This book addresses the needs of both graphic designers who want to get the most out of the format and programmers who want to add full PNG support to their own applications. This is the definitive work on file formats - the book that will become a classic for graphics programmers and everyone else who deals with the low-level technical details of graphics files. This book integrates the formal principles of the Bauhaus Basic Course into an introduction to digital media production with the Adobe Creative Suite, or the FLOSS graphics applications. With this book, you'll learn hands-on how to take your website's production values to a new level by incorporating 3D models and animations, mind-blowing visual effects, and advanced user interaction. This book is a complete tutorial and reference that assumes no previous knowledge of C, C++, objects, or patterns. Provide sufficient introductory material for engineering graduate students with background in programming in C and C++ to acquire the skills to leverage modern open source toolkits in medical image analysis and visualization. This is the previous page of Computer Graphics, we are in the processing to convert all the books there to the new page. Please check this page daily!! !